Worms, like people, tend to avoid foods that have made them sick in the past. By coaxing worms to select only healthy choices from a menu of bacteria, Rockefeller scientists show that one brain chemical, serotonin, helps cement behavior. Image: Specific neurons express serotonin (bright areas of image) in response to learning. 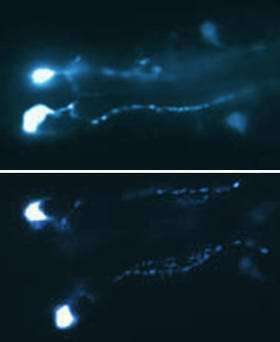 In worms that were trained to avoid poisonous bacteria (top), more serotonin was expressed than in worms that were not trained (bottom). Thanks to their simple 302-cell nervous system, the worm is a great model for biologists studying how brain cells work. Unfortunately, worms are not known for their memory. So when Rockefeller University’s Cori Bargmann wanted to study how worms can form memories based on odors, she first needed a way to prove worms could learn and remember. Their findings, released today in the November 10 issue of the journal Nature, show not only that the worm learns to avoid food that makes it sick, but also that this memory is accompanied by a surge of the neurotransmitter serotonin, which may cement the negative reinforcing behavior. The research, which points to a conserved, ancestral role for serotonin in communication between internal organs and the nervous system, may have implications for the treatment of nausea induced by chemotherapy drugs. “In the past, it’s been difficult for us to get the worm to learn anything, so we couldn’t take advantage of their simple nervous system and ask the kinds of questions we wanted to ask,” says Bargmann, Torsten N. Wiesel Professor and head of the Laboratory of Neural Circuits and Behavior at Rockefeller and an investigator at the Howard Hughes Medical Institute. To find out if worms could learn to avoid bacteria that would make them sick, Zhang, Bargmann and co-author Hang Lu developed a series of experiments. First, the researchers gave the worms two bacteria to choose from, one pathogenic and one harmless. After a training period, the worms consistently rejected the pathogenic bacteria. Then, to be sure that the worms had formed a memory based on their experience with the pathogenic bacteria, and were not simply making lucky guesses, Lu, an MIT-trained engineer, designed an eight-armed “worm maze” using the same techniques that engineers use to construct microelectronic devices. The maze served as a type of multiple-choice, rather than true-false, test, offering the worms four different bacteria (each bacterium was placed in two of the maze’s eight chambers). After about four hours, the worms started to reject the bad bacteria. Interestingly, Bargmann notes, after a longer time, the worms learned to like good bacteria, although more research needs to be done to understand why. At the molecular level, the researchers found that the neurons of worms that ingested pathogenic bacteria produced an abundance of the neurotransmitter serotonin. And serotonin production is one of the critical components of learning. In all animals, including humans, the neurotransmitter serotonin communicates information from the internal organs to the nervous system. The nausea associated with chemotherapy, for example, is based on serotonin release, and the anti-nausea drugs that doctors give to chemotherapy patients are serotonin blockers. Unexpectedly, Zhang also found that not only do the neurons release more serotonin, they produce much more of it. The researchers found that this increase in serotonin production, which had not been previously observed, resulted from changes in the enzyme that makes serotonin and an increase in the transcription of this enzyme. “Over the course of about 24 hours, serotonin seems to go from just released to more synthesis and more release to more enzyme and more synthesis and more release,” says Bargmann. This finding, Bargmann says, could represent an unexpected avenue for developing new treatments for chemotherapy-induced nausea.